There are several ways to organize your groups in your Contacts. 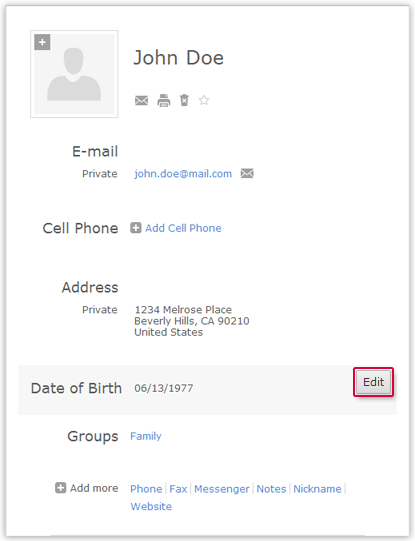 You can assign contacts to groups or fill already existing groups with your contacts. Select the contact from the list of contacts (on the left). Hover over the Groups section in the contact view (on the right) and click Edit. Activate the check box of the required group. Every contact can belong to any number of groups. This method only works if the contact and the group are displayed on the screen at the same time, i.e. you do not have to scroll. Ensure that the contact and the corresponding group are displayed simultaneously, e.g. using the search. Drag the contact to the required group. In the group view (on the right), click the Add more Contacts button. In the contact list (on the left), activate the check boxes of all contacts you want to add. If necessary, you can restrict the list by filtering or using the search function.